DCGpac presents you with Kangaro Stapler Trendy – fit for use in office, school, and home or for studies. It has a sturdy plastic body with high quality steel components making it a reliable and convenient to use stapler. With its quick loading mechanism, it enables speedy and comfortable working experience in your work-place settings. It has a staple pin storage compartment at its bottom and also, comes equipped with a built-in staple remover and a reload indicator. 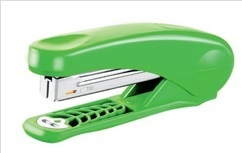 The Stapler Trendy comes in a variety of different models and colours for you to choose from. Select the style and sizes of stapler trendy to suit your usage. Order now to buy online to receive a quick delivery.